At least 10 people were killed in Tehran on Saturday as police clashed with "terrorists" in protests over a disputed poll, Iranian state TV says. State media also said family members of Akbar Hashemi Rafsanjani - a powerful opponent of the re-elected president - were arrested during the protests. Defeated candidate Mir Hossein Mousavi has condemned "mass arrests" of supporters, Reuters news agency says. Meanwhile Iran has ordered the BBC's Jon Leyne out of the country. "With regret, we can confirm that Jon Leyne, the BBC's permanent correspondent in Tehran has been asked to leave by the Iranian authorities. The BBC office remains open," a BBC statement said. Dubai-based Al-Arabiya TV said on Sunday its Tehran office, which was closed by the Iranian authorities a week ago, had been ordered to stay shut indefinitely for "unfair reporting" of the 12 June election. And Newsweek magazine said its correspondent Maziar Bahari - a Canadian national - was detained without charge on Sunday morning and had not been heard from since. Campaign group Reporters Without Borders says Iranian authorities have detained 23 local journalists and bloggers since post-election protests began. The demonstrations were sparked by disputed presidential elections, but have since escalated into Iran's most serious internal conflict since the 1979 Islamic Revolution. Supreme Leader Ayatollah Ali Khamenei has demanded an end to the protests. Witnesses said there did not appear to be any opposition gatherings or demonstrations on Sunday, according to the AFP news agency. Iran police chief Gen Esmaeil Ahmadi Moghaddam warns any further unrest will be confronted "decisively"
Iranian officials again attack the UK for "interfering". State media reports of Saturday's violence cannot be verified as foreign media in Iran are being severely restricted. Mr Rafsanjani is one of the most influential figures in Iran. He is also an opponent of President Ahmadinejad. He's been silent during this crisis, but it's certain he's active behind the scenes. Mr Rafsanjani did not go to the prayer session in which Iran's Supreme Leader Ayatollah Khamenei made a very tough speech endorsing the election result and saying that opposition leaders would be responsible for any bloodshed. That was another sign of the fracture in the leadership of this country. They accused "rioters" of setting two petrol stations ablaze and attacking a military post. 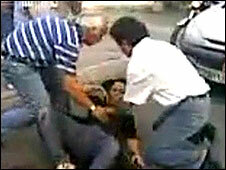 The state TV report said and more than 100 people had been wounded in clashes between police and "terrorist groups". 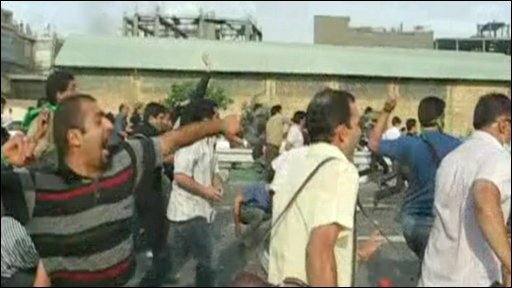 The BBC's Jeremy Bowen, in Tehran, says the reports could serve as a warning to Iranians that if they take part in further protests they risk getting embroiled in violence, or being identified as a "terrorist". Mr Rafsanjani's daughter, Faezeh - who addressed supporters of protest leader and defeated presidential candidate Mir Hossein Mousavi on Tuesday - was among the Rafsanjani family members arrested on Saturday. Faezah Hashemi was still being held on Sunday, but the other relatives had been released, Press TV said. The arrests suggest the political dispute is fracturing the heart of the Iranian leadership, our correspondent says. Mr Rafsanjani - an opponent of President Ahmadinejad - has maintained a public silence over recent days, but it is certain that he is active behind the scenes, our correspondent adds. Witness accounts on Saturday suggested police used live rounds, batons, tear gas and water cannon to break up demonstrations which went on late into the night. Among unconfirmed material posted on the internet after Saturday's protests, a brief graphic video clip appearing to show a teenage girl dying from a wound, has fuelled anti-government feelings. The girl, who has been called Neda, had been protesting with her father in Tehran when she was shot by pro-government Basij militia, according to one blogger. Critics of the June presidential poll - which gave President Ahmadinejad a resounding 63% of votes, compared with 34% for Mr Mousavi, his nearest rival - say there is evidence of widespread vote-rigging. In a statement on his website, Mr Mousavi accused authorities of cheating the Iranian people out of a rightful election result, reports said. The Iranian leadership has repeatedly accused foreign powers of interfering in Iran's domestic affairs, with the UK the particular focus of ire. On Sunday President Ahmadinejad again highlighted alleged interference by the UK and US. "By making hasty comments, you will not have a place in the circle of the Iranian nation's friends. Therefore, I recommend you to correct your interfering positions," he said in a statement on his website. But UK Foreign Minister David Milliband said he rejected "categorically the idea that the protesters in Iran are manipulated or motivated by foreign countries". In other reported developments, state TV said members of the exiled opposition group Mujahideen Khalq Organisation (MKO) had been arrested for "terrorist activities". 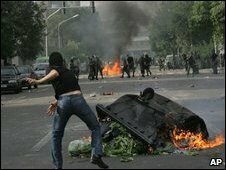 The report said they had been burning buses and smashing public property - and had been taking orders from their operation room in the UK.